I love eating salads in the summer time, not just leafy green salads but all sorts like chicken salad, cucumber salad, tuna salad, egg salad, potato salad, I can go on and on. This week I made a lentil salad with some fresh tomatoes and dill from Hampstead Farms and basil from my own (balcony) garden. This salad is not only refreshing and delicious but also very healthy. Bring 4 cups water to a boil in a 2-quart heavy saucepan with lentils, garlic, onion and 1/2 teaspoon salt, then reduce heat and simmer, uncovered, until lentils are just tender, 10 to 15 minutes. Drain in a large sieve, then transfer to a large bowl. 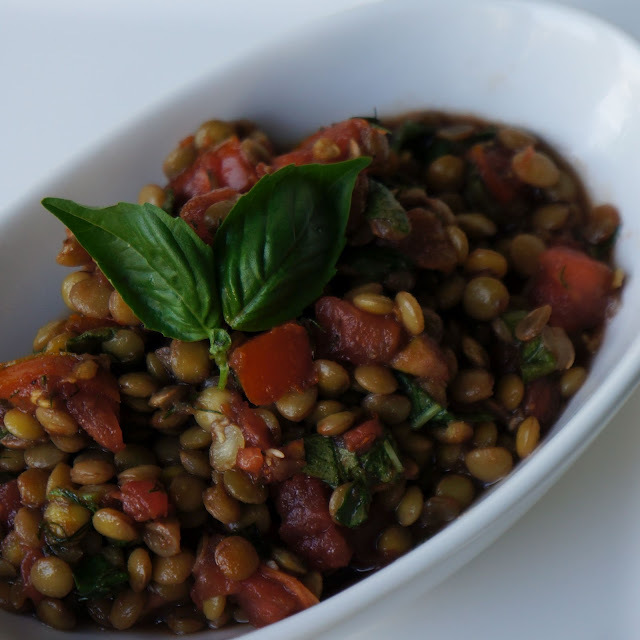 Toss hot lentils with tomatoes, dill, basil, lemon juice, oil, pepper, and remaining 1/2 teaspoon salt, or to taste.